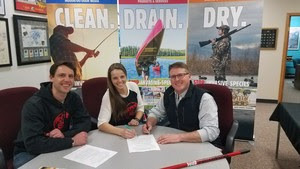 White Bear Lake, MN – Wildlife Forever is proud to announce MAJK Solutions LLC as its newest corporate partner in the fight against invasive species. The Aqua Weed Stick™ is an innovative product made by MAJK Solutions to assist boaters and anglers with removing aquatic weeds attached to trailers and equipment. The new strategic partnership will provide tools and educational resources to empower Clean Drain Dry behaviors at boat ramps across the country. “As an angler, I was frustrated there were no tools at the access to remove weeds. I was tired of getting dirty, crawling under my trailer to clean my boat. We designed the Weed Stick to help cut, pull and remove any attached weed,” said Michaela Anderson, inventor of the Aqua Weed Stick. “Partnering with the Clean Drain Dry Initiative fits our mission to help prevent invasive species from reaching more lakes,” Michaela said. “Every boater needs an Aqua Weed Stick. Since so few accesses have tools to Clean Drain and Dry, this is a great product that makes sense and helps to avoid transporting weeds,” said Pat Conzemius, Executive Vice President of Wildlife Forever. “Zebra mussels are often transported on weeds so this tool will help against many different invaders,” said Conzemius. The Aqua Weed Stick and can be purchased through the Clean Drain Dry Initiative product catalog. Several product options include extendable handles with reach up to six feet for larger boats and pontoons. About MAJK Solutions: The Aqua Weed Stick was created out of frustration. After spending over an hour to pull the weeds off the boat trailer, becoming dirty, wet and very frustrated! There had to be a better way! After purchasing a 3D printer and testing over 30 iterations we arrived at the perfect design, a mix of simple, small and easy to use features to make weed removal simple and fast. View the video here. The Clean Drain Dry Initiative™ is the national public awareness campaign to educate outdoor recreational users on how to prevent the spread of invasive species. Strategic communications, marketing, outreach and educational services provide access to consistent messaging, and resources for implementing AIS prevention programs. To learn about partnership opportunities, contact Dane Huinker at DHuinker@Wildlifeforever.org or visit www.CleanDrainDry.org.